CALCUTTA is a fairly run-of-the-mill yet entertaining Paramount potboiler starring Alan Ladd and Gail Russell. Neale Gordon (Ladd) and Pedro Blake (perennial Ladd costar William Bendix) are pilots flying the Calcutta-Chungking route. When their friend Bill (John Whitney) is murdered, Neale and Pedro try to find out why. Along the way Neale falls for Bill's fiancee, Virginia (Russell), who seems to be a sweet and innocent young woman; but while Neale may be attracted to Virginia, he doesn't trust her for a second. The movie seems to have been made entirely on the Paramount backlot, utilizing fairly high quality process shots, but despite being studio bound, the film has a nice atmosphere and is populated with interesting characters. The virile, charismatic Ladd was really quite something to watch in 1947, and he's matched by the beauteous Russell. Quiet, gentle-eyed Russell was a unique screen presence, and she's rather cast against type here as a woman of mystery. The same year's ANGEL AND THE BADMAN, in which she gave a charming performance, was more suited to her talents, but it's interesting seeing her in this. Bendix doesn't have a great deal to do in this film, but that's not necessarily a bad thing, as I find a little of him goes a long way. On the other hand, I was particularly intrigued by the performance of June Duprez, playing Neale's girlfriend, and wished she had more screen time. Duprez, the star of the British films THE FOUR FEATHERS (1939) and THE THIEF OF BAGDAD (1940), is an attractive and sympathetic character, and she has great chemistry with Ladd. They have a brief scene in his apartment which is pretty steamy for 1947. The cast also includes Lowell Gilmore, Edith King, Benson Fong, and Gavin Muir. The movie runs 83 minutes. 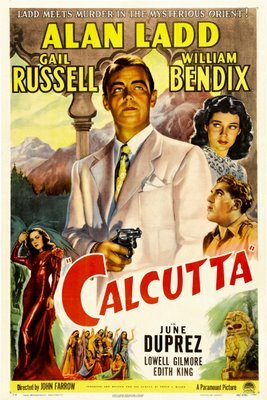 John Farrow directed CALCUTTA, a year before he made THE BIG CLOCK (1948) with Ray Milland. He would also direct Gail Russell again in 1948's NIGHT HAS A THOUSAND EYES, costarring Edward G. Robinson and John Lund. It's a familiar refrain when it comes to Paramount movies, but this film does not appear to have ever had a VHS or DVD release. Copies can be found on the Internet for sale by out-of-print dealers. There's another take on this film in a 2009 post at Where Danger Lives. 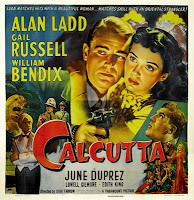 It may not be a particularly great film, but there are far worse ways one could spend a winter evening than curled up enjoying Alan Ladd and Co. in CALCUTTA. March 2017 Update: I thoroughly enjoyed revisiting this movie in a pristine new digital print at the Noir City Film Festival.